ENO JungleNest Hammock. Trekking into the metropolis of biters and skeeters? Don't forget your JungleNest. It's the perfect union between the SingleNest and the Guardian Bug Net. 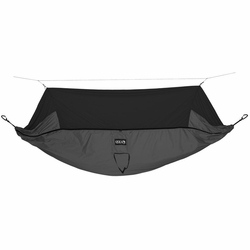 This all-in-one hammock/bugnet combo immerses you in complete insect defense without sacrificing suspended comfort. Crafted from a 210T Nylon Taffeta Ripstop base and mesh cover, the JungleNest features internal hanging loops, organizer pocket and height adjustment, plus a full length side zipper to make access a breeze. It's a jungle out there, so hide away in the serenity of complete insect protection. Eagles Nest Outfitters.